﻿ Rivertown Brewery and Barrel House - Ohio. Find It Here. Come exBEERience the Monroe Barrel House with a 30 tap bar, 24 tap patio, and table service! 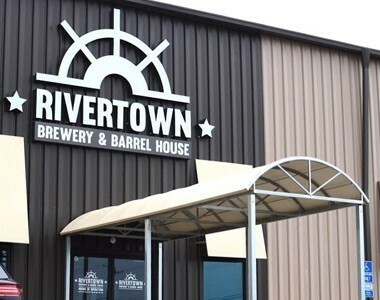 Rivertown Brewery and Barrel House is always pouring a variety of freshly brewed, handcrafted Rivertown liquid on draft in addition to guest brews, cocktails, wine, and soda. The Barrel House in Monroe, Ohio is dedicated to encouraging connection, conversation, and providing all guests with an exceptional ExBEERience. Not only are the brews great, so is the BBQ! A large menu has everything from Smoked Pork Poppers to Street Tacos to a Philly Brisket Flatbread.